At the Stockholm group of the World Championships, there has been a minor upset brewing in the form of the Swiss hockey team. The Stockholm group of the World Championships was touted to be the tougher of the two groups as it featured talent packed teams, such as Sweden, Canada and Czech Republic. No one could have guessed that the Swiss that are stealing the limelight. In the opening game of the tournament, the Swiss handed a 3-2 loss to the hosts Sweden and then carried on the run of upsets by beating Canada in the penalty shoot out and then convincingly seeing off the Czech team by 5-2. The team is comprised of players who play in the Swiss National League. The only NHL name that might be familiar to people is Nashville Predators’ defence man Roman Josi or New York Islander’s prospect Nino Niedereitter. The other recognisable name in the Swiss roster to most hockey fans is goalie Martin Gerber, who won the Stanley Cup with the Hurricanes in 2006. The Swiss have so far faced and won the toughest countries in its group – and barring a complete disaster – should be progressing into the second stage of the competition as a team that should not be taken lightly. In the past few years it has been the Swiss who have taken the biggest strides in terms of developing their standard of players and their results at the World Championships stage and it wouldn’t be a surprise if the Swiss were in medal contention this year. The team is getting steady scoring from all lines and in goal, Gerber has been strong, posting a 1.92 GAA and 92.31 Save percentage in three starts. Perhaps if the Swiss keep going the way they have been, we might see them in the medal games this year. Though it would take a lot to see them in the final, the Swiss could be on the way to building its own Cinderella story for this year’s World Championships. For amazing deals on ice hockey equipment from sticks, protective, skates to training aids, visit Nekoti Hockey, The UK’s favourite ice hockey warehouse. IIHF has announced that the 2013 World Championships will be streamed live online via YouTube. The service, which was launched last year was welcomed by hockey fans across Europe, but things soon turned sour after media partner pressure. The IIHF had imposed a blackout of the YouTube streams for countries that had exclusive TV broadcast deals in place, but then had to take further measures as tech savvy consumers found ways around the geo-blocking. 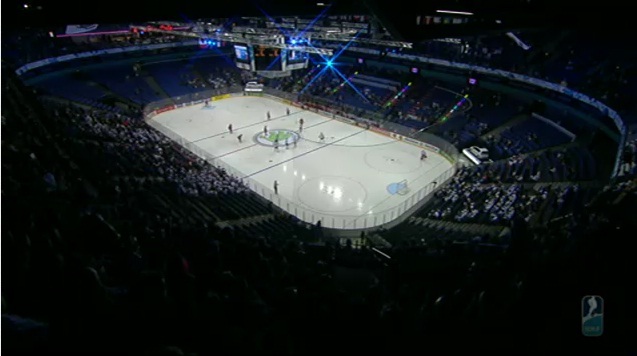 To many fans’ displeasure, the IIHF then had to move its broadcasts to start half an hour after face off to make sure that no-one would be circumventing the geo-blocking. However, this year the free – and more importantly – live broadcasts will be back. The service will be available across many countries, but IIHF has already ruled out some countries on its promotional YouTube video. Countries where YouTube broadcasts are not available include: Sweden, Finland (the host countries), Denmark, Norway, Russia, Belarus, Ukraine, Kazakhstan, Czech Republic, Slovakia, Hungary, Romania, Swizerland, Germany, Canada, USA, Latvia, Lithuania, Estonia and France. Where last year’s streaming ended with a sour note, I do think that it is the right thing to do to bring hockey to a wider fan base. Even though the IIHF broadcast the games with 30min delay last year, my point will be that any sports event should be broadcast live. The word travels quickly these days and it is important that if you are broadcasting on a social platform such as YouTube, you provide a live stream instead of a deferred one. So there, another year of hockey on the web by the looks. The 2013 World Championships will be played in Stockholm, Sweden and Helsinki, Finland between 3rd and 19th of May 2013. The news has literally just broken on Twitter with the IIHF announcing that all of the games from the 2012 Ice Hockey World Championships will be streamed live via YouTube. In a move that resembles the KHL’s startegy of showing games free of charge on YouTube, is bound to attract more fans to look at the games and watch the videos. However, it is still expected that the IIHF will offer paid for packages for the games where you can buy rights to watch the games of your chosen team. However, the offer is not available to all as some countries have been geo-blocked. The list of Geo-Blocked countries includes: Belarus, Denmark, Estonia, Kazakhstan, Latvia, Lithuania, Norway, Russia, Sweden, Ukraine and the USA. EDIT: It has now emerged (at 14:46 GMT) that the games will also be geo-blocked in Finland. (Edit: I have deleted the paragraph about the Finnish TV rights for the games) I can only suspect that the YouTube streaming would’ve hurt the TV and media partners of the games, though I doubt that the decision to stream the games came from the Helsinki/Stockholm organising committee but from the IIHF itself. However, it is a welcome move to offer the games via YouTube. I for one (based on my geographic location) applaud the IIHF’s decision to move. It is a bold new strategy and will expose the sport to a wider fan base, which will be great for the sport. The YouTube channel can be found at: http://www.youtube.com/icehockey. The schedule for the games is here: http://www.iihf.com/competition/272/home-oc/tournament-info/game-schedule.html Please note that the game times are in Swedish and Finnish times respectively.